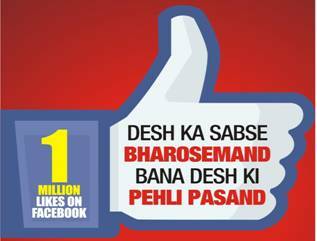 India’s leading Hindi news Channel Aaj Tak has created milestone on the Digital world by crossing the much coveted 1 million mark on Facebook. The most trusted channel is widely followed by the Facebook users and boasts of more than a million fans on the digital world and thus, achieving the feat of becoming the first Hindi website to have 1 million fans. In the fast changing scenario, news consumption on social media has been on the rise. Aaj Tak, over the last few years has been instrumental in reaching out to viewers on social media and the one million mark shows the popularity of the channel among the Digital world. Aaj Tak on Facebook has been actively engaging with the audience by using various tools & mediums such as debates, polls, issues & news. Social media is a high interaction platform where the communication is between both the parties & Aaj Tak has always been raising the issues of the public of the digital platform.